As the largest chocolate manufacturer in North America, Hershey is always reshaping the way it does business in order to remain at the top. Technology especially helps the Pennsylvania-based company improve in a number of key areas. For instance, the prevalence of online shopping and self-checkout lines are hurting Hershey’s sales from impulse buyers. To encourage more “unplanned purchases,” the company plans to add small kiosks near self-checkout machines and curbside pickup stations that will give customers one last chance for a candy bar before they go. 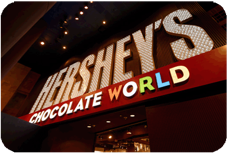 Hershey is even more cutting edge in its efforts to harness the power of big data. Along with a number of other packaged-good companies, Hershey is working with Palantir Technologies to gain a better understanding of worldwide food purchasing trends. The idea is that Palantir would send Hershey information about specific sales patterns that the company could quickly take advantage of. For example, say the company discovered that customers in Detroit were buying candy more often from smaller grocery stores than larger ones. Hershey could then use that information to move their stock accordingly. Along with data mining, Hershey is jumping on another one of technology’s biggest trends: 3D printing. The company will soon install a permanent chocolate printer at its Chocolate World Park, allowing visitors to order sugary sculptures in various shapes, including their own likeness. “This technology will be fundamental to the way people interact with food in the future,” said Hershey marketing manager Jeff Mundt. “If we don’t get on the edge and lead the way to edible food printing, somebody else will do it for us. And we’re all about innovation.” Depending on their complexity, the designs take anywhere from a few minutes to an hour to complete. While the machines strictly work with chocolate now, Hershey is open to printing with other types of food as the technology becomes even more advanced. As a market leader, why does Hershey conduct continuous research? What major benefit does 3D printing offer the chocolate business? Source: Drew Harwell, “Hershey’s Plan to Hook Americans onto Impulse-Buying Chocolate Again,” The Washington Post, January 29, 2015; Michal Lev-Ram, “Hershey Turns Kisses and Hugs into Hard Data,” Fortune, December 4, 2014; Beth Snyder Bulik, “Edible 3D Food Printing Becomes a Reality at Hershey,” Ad Age, January 28, 2015. Photo by: Daniel Ramirez.